Stamping Rules! : Shop My Stash! TO BE UPDATED SOON - Unpacking still in progress! Items highlighted in pink are pending sale. Contact me with your zip code and your list of goodies and I will be happy to figure out the shipping cost for you. Please let me know if you need photos of any of these items. Thanks for looking, Stamping Friends! NEW! 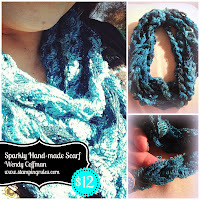 Sparkly Sequin handmade scarves just $12 each. Great for gift giving! my new Stamping Rules ETSY Shop! Or place a custom order, made just for you! Available colors are Black, Cream with Rainbow sparkles, Deep Red, Teal, Rich Plum, or Grey Ombre. Just email me if you have custom needs!